On this page you'll find videos briefly explaining how different varieties of soda dispensers operate as well as the various cooling methods used with soda fountains. They're not lengthy—around 2 minutes each—and they'll give you a better understanding of the differences and similarities as well as benefits or recommended uses for the various equipment. Ice bins, cold plates, remote coolers—these are the primary devices used for cooling soda water and syrup lines used in soda fountains. However, their purpose is not simply to make beverages cold for your enjoyment, it is to keep the temperature of the carbonated water cold enough so that once dispensed from the pressurized system, the carbon dioxide (CO2) in the soda water does not escape—causing a "flat" soda. Which cooling method you choose will depend heavily on the application. Some lend themselves better to home and small office uses while others are typically used in commercial situations. The video above will tell you everything you need to know to make the right choice! Most importantly, the ice held in the ice bin serves the crucial purpose of cooling the carbonated water and syrup lines. Without ice in the ice bin, the lines won't be cooled and beverages will likely dispense with little to no carbonation. In other words: KEEP THE ICE BIN FULL DURING OPERATION! Obviously, the secondary function of the top-mounted ice bin is to allow the machine to easily dispense ice into your cup when you place your cup under the ice chute. It's recommended that you fill your cup with 1/3 ice for the best quality drink. The ice will help to retain the carbonation in the beverage once it has been dispensed. We hear this question fairly often and unless you've got a really keen eye or you just happen to know a bit about soda fountains, you probably wouldn't notice that some machines have an ice maker mounted on top of them and others don't. This is an option—you can opt to fill the machines manually or install an ice maker on top (or both, in some cases!). This helps people purchase ONLY the equipment they NEED or can afford. If you're a restaurant, it's possible you may already have a standalone commercial ice maker, in which case you may not want to purchase an additional one just for soda when you can just fill it manually. Ice and beverage dispensers come in many different sizes and models—newer models may even have features such as "flavor shots" (which can add some extra flavoring to your drink) or cold carbonation (which delivers higher quality soda water). 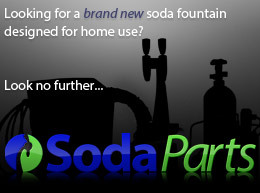 Like most other soda fountains, they can be set up to dispense carbonated or non-carbonated beverages or a combination. Counter electric dispensers are a style of beverage dispenser where a cold plate is NOT used to cool the soda water and syrup. Instead, this unit creates a block of ice which the lines run through to become cooled. These are typically found in commercial environments but are also popular for residential use due to the fact that they do not require ice at all times, since the internal ice block is self-sustained. They can also be set up for carbonated or non-carbonated beverages and are often found with 4 to 10 dispensing valves. Drop-in dispensers, also called ice bin cold plate units are one of the most basic types of soda fountains. Essentially, they're very similar to the Ice and Beverage / Ice Combo dispensers, except in this case, the ice bin is underneath the dispenser (or seperated from it altogether in the case of a soda gun/ice bin cold plate dispenser). These models are generally used by concessionaires or bartenders—or anytime a server will pour beverages for the customer (i.e. NOT self-serve). This is mostly due to health regulations in an effort to keep dirty hands from contaminating the ice bin. Like the ice and beverage / ice combo dispensers, the ice bin has a built-in cold plate which, when full of ice, will cool down the soda water and syrup lines. "Drop-in" refers to the characteristic flange on the ice bin allowing it to be installed into a hole in a countertop or a standalone cabinet. Drop-ins come in various sizes with anywhere from 4-10 valves, but you can also use a soda gun with an ice bin cold plate. Either way, they can be set up for both carbonated and/or non-carbonated beverages. Cold plates are used in soda fountain systems to cool product down so that it remains carbonated once dispensed. Most importantly, your carbonated water MUST be run through at least one pass on the cold plate to cool it. Otherwise, when you dispense a beverage, it will not be cooled sufficiently and the CO2 gas will quickly escape from the beverage. A cold plate must be installed into an ice bin and covered with ice for the best performance.